Any business, whether a Fortune 500 company or a local mom and pop store, can suffer from bad publicity. With the amount of activity on social media sites like Facebook and Twitter, one person’s complaint about a particular aspect of your business can quickly turn into an avalanche of negative feedback if not handled properly. Worse still, handling the initial negative comment or comments incorrectly can have an even more damaging effect on your business and its image. All it takes is one bad response to a negative review to start an ugly argument; the result being that poor response can tarnish your business’ reputation for a long time. When you respond badly to a negative review, your response won’t just be read by the initial reviewer. What you say can and likely will be read by everyone who reads your reviews or looks for your feed, whether it’s on Google, Facebook, Twitter, Yelp, or any other platform. It also shows that you can’t take criticism gracefully, and no one wants to do business with someone if they fear backlash from giving an honest review that is less than five stars. 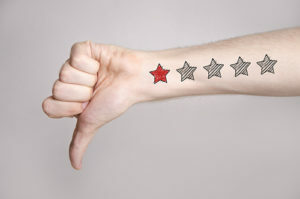 What’s the proper way to respond to a negative review? Respond positively. Acknowledge that the negative reviewer was unhappy with some aspect of your service or product. Avoid becoming defensive – whether you were in the wrong or not, it automatically makes you look like you were if you take a defensive tone. Rather, be engaging, humble, and willing to listen. Take it offline. Eliminate the possibility of a negative online discussion by asking the person to call your business directly so that you can discuss and remedy the issue in person. Not only will the customer feel as if you’re taking the time to right what they felt was wrong, but it also shows readers (potential clients) that you can respond appropriately, that you care enough to try to fix the issue, and that you’re willing to grow from the feedback. Offer to make it better. There exists what Terry College of Business professors Michael McCollough and Sundar Bharadwaj call the service recovery paradox, which is the result of a very positive service recovery, causing a level of customer satisfaction and/or customer loyalty even greater than that expected if no service failure had happened. If you can manage to help your negative reviewer feel as though the wrong was righted and gain back their business, it is possible to recover from a negative review.